If you are interested in bigger rewards, then you should definitely give progressive video poker a chance. It is just as fun as the regular Jacks or Better variation but it is providing a huge jackpot for those who manage to land Royal Flush or some other specific hand. 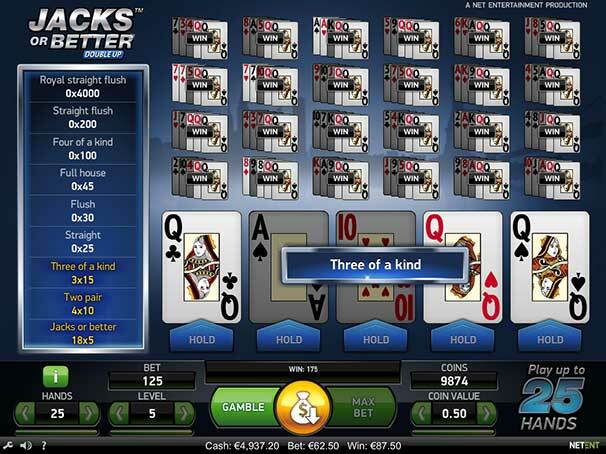 If you enjoy playing progressive slots, then you should give progressive video poker a go. The difference between the two casino games is that with video poker, players actually have the chance to affect the outcome of the game thanks to their decisions. This automatically gives you a better chance of sweeping the intensifying reward for the highest-paying hand. There are several things you should know before tackling the next progressive video poker machine you see at the casino or at an online gaming site. If you come across a variation of video poker which offers a progressive jackpot do not waste your time and give the game a try. Compared to other casino options, video poker is definitely one of the best games that give you the opportunity to sweep a generous progressive jackpot. The majority of progressive video poker variations will reward the highest payout for Royal Flush but there are some versions which may give the jackpot to players who manage to form a Straight Flush or a special type of Four of a Kind. You will notice that the payouts for Full House and Flush are lower with progressive video poker variants. This is why compared to the 9/6 payout of full-pay Jacks or Better, you will see that Full House pays 8 to 1 and Flush rewards a payout of 5 to 1 when there is a progressive jackpot included in the game. One of the most advantageous things about progressive video poker is that the more the amount of the progressive jackpot increases, the lower the house edge becomes which gives players a bigger advantage. In fact, at a certain point, the progressive reward can reach such point that the scales can tilt in favor of the player and give him/her an edge over the casino. This would mean that even if you are playing an 8/5 Jacks or Better with a progressive jackpot, at a certain point, you can enjoy the same expected return as the one that the 9/6 full-pay variant is offering. As more players test their luck and skills on progressive video poker games, the more the prize increases with every failed attempt to land Royal Flush or another special hand that rewards the jackpot. Progressive Video Poker Additional TipsThe progressive jackpot can be won only if you are betting the maximum amount of coins which is usually 5. Whether you are playing at a land-based casino or online, the progressive game you are betting on will be connected to a few other machines or games that share the same progressive jackpot. This is why the payout for the jackpot is rapidly changing and increasing due to the players who have contributed with their bets. While it is true that the payout of the progressive variant can be the same as the one of the full-pay options, this does not mean that you can use the same strategy on both of the variations. This is due to the fact that progressive video poker offers lower payouts for the rest of the hands which gives the game a higher variance. Naturally, this requires a different type of video poker strategy in order to optimize your winnings. With progressive video poker, there is also the moment of “reset”. This is the point at which someone has won the jackpot for Royal Flush and the meter of the cumulative reward starts increasing again. The starting point of the progressive jackpot is usually the standard payout for Royal Flush on non-progressive video poker games. Many progressive video poker machines are with a 1%-meter which will mean that for every $1 players stake on the game, 1% of their wager will be counted towards the progressive jackpot. This, however, is not necessarily the case with all progressive video poker games. What is the Benefit of Playing Video Poker? 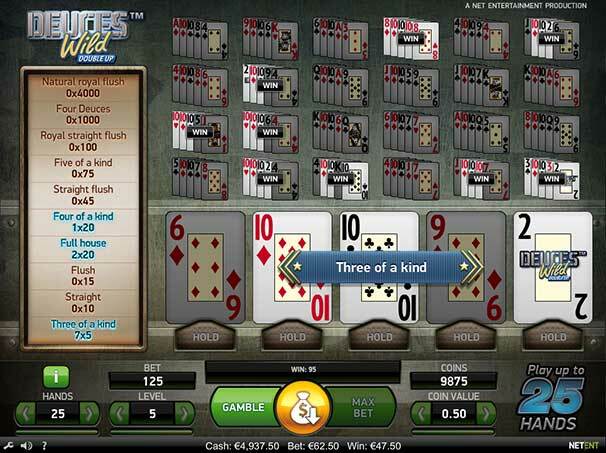 While the house edge is something which cannot be overcome with other games and players try to gain as much advantage as possible by claiming various promotions and incentives, the video poker experience is quite different. When playing some specific variations of video poker, one can gain a huge advantage and, what is better, if you play a progressive variant, the house edge will continue to drop down as the cumulative jackpot increases. One of the most important tips for new video poker players is to always bet the maximum amount of coins. This is why making your bets on progressive variations makes sense as you will be able to receive even more massive payout if you form a Royal Flush. While the payout for the rest of hands can be lower, video poker games with a progressive jackpot can definitely turn the tables and offer players a better advantage as the payout for Royal Flush is constantly increasing. While other casino games also offer progressive jackpots, those who opt for chasing the cumulative prize of video poker games definitely have a better chance of enjoying a fruitful outcome. Since you already know, the player’s decisions take a huge part in the outcome of the game, there is actually a great opportunity to form Royal Flush when using the right strategy. While chasing the progressive payout, you can still enjoy a great reward for lower hands but that is only if you use the right type of strategy. If you have already mastered the right type of strategy and you have chosen a progressive video poker game with generous payouts, you can definitely revel in fruitful gambling even if you do not win the jackpot. Since generally speaking, the progressive jackpot on the majority of video poker variations is won for Royal Flush, it is pretty obvious that the odds of hitting the jackpot are not that high. If you are wondering, we will let you know that the chances of landing this rare hand are estimated to be 1 in every 45,000 hands. Of course, your chances are pretty slim but it is no surprise why would the casino award the progressive prize for this hand. If you happen to land Royal Flush, however, you have the opportunity to boost your gaming balance with a significant amount of money. One particularly attractive feature of video poker is that some variations have a very low house edge and when one uses the right type of strategy they can actually gain an advantage over the casino. Not only will you have the chance to improve your odds by using the perfect strategy but with progressive video poker, you will actually notice that the house edge decreases as the jackpot becomes higher. There is one thing you should not underestimate when choosing the progressive video poker game you want to play and that is the meter-rise. As it was previously mentioned, many machines use the 1%-meter, however, there are some variations which have a progressive jackpot that increases with a faster pace. For instance, 5/6 Jacks or Better is one of the worst-paying variations of the game with a payout of mere 6 to 1 for a Full House and 5 to 1 for a Flush and its expected return is estimated to be 94.99%. However, when adding a 4.5%-meter to the game, it becomes one of the best progressive video poker options one can play. The Odds of Winning a Progressive Jackpot on Video Poker Additional TipsThe amount of the meter-rise on a progressive video poker machine can be determined easily around the time when no one is playing the game. If you make a bet of $10, you should take a look at the difference in the jackpot following your contribution. After that, you simply divide the size of the progression by the size of the bet you have made. Let us assume that the progressive jackpot has increased with ¢10 after your wager of $10. When you divide 0.10 by 10, you will get 1% which will be the meter rate. The great thing about progressive video poker games is that they do not have a fixed RTP and the bigger the jackpot becomes, the better your chances of sweeping a massive win become. When You Should Play Progressive Video Poker? Keeping in mind that the house edge of progressive video poker games is constantly changing, it is clear that there are certain points when it is more beneficial to refrain from playing. While with jackpot slots it is not possible to determine when the expected value (EV) has surpassed 100%, the experience with progressive video poker is completely different. You should know that when the jackpot is a sum which is close to the typical payout for Royal Flush, the EV of the game is below 100% and it is not worth it playing the game. The standard payout for Royal Flush on Jacks or Better is 4,000 credits for staking 5 coins and even if the payout on a progressive variation has reached 6,000 credits, the EV still has not surpassed 100%. By knowing when is the “break-even” point, you will be able to determine when is the best time to play a certain progressive video poker game. Simply said, this is the moment when the expected return reaches 100% and playing before the break-even point is simply not beneficial for you. If you come across a progressive variant of 9/6 Jacks or Better with a denomination for bets of ¢25, the break-even point is around the sum of $1220.00, while for the 9/5 variant a 100% of EV is achieved with a jackpot of $1696.00. More often than never, the progressive version of Jacks or Better is offering a payout of 8 to 1 for a Full House and 5 to 1 for a Flush. In this case, the break-even point is at a jackpot of $2166.50. The moment when the EV reaches 100% on a ¢25 Double Double Bonus machine with a 9/6 payout is at a jackpot of $1,460.50. The 9/5 variant reaches the break-even point at $1,943.75, while for the 8/5 Double Double Bonus machine the EV is at 100% when the jackpot is $2,378.75. It is pretty obvious that if the progressive reward is below these points, it is really not worth it playing the game. If you are ready to play progressive video poker, you might want to keep a few tips in mind. They will help you to enjoy a rewarding outcome whenever you embark on such gambling adventures. One of the first things is to check whether a game is worth playing at the moment. For this, you will have to check the current jackpot of the specific video poker game and determine whether it has reached its break-even point. On the same note, you should also be careful not to wait for too long. While you are advised to start playing progressive video poker when the jackpot has reached close its break-even point, you should also be aware that you are not the only player who is paying attention to the cumulative prize. This is why you should be careful not to miss your chance to play before the “reset” of the meter. If you are determined to start playing progressive video poker at a certain payout for Royal Flush, then you have to be ready to set a bigger budget. Before you start betting your money, you should be well aware of your funds and determine how much you are willing to spend. One of the most important things is to set a certain spending limit and stick to it. While you might be playing just a few hands before hitting the jackpot, there is also the possibility to play more hands than you have anticipated. This is why it is important to have enough budget that will allow you to hit the progressive reward. 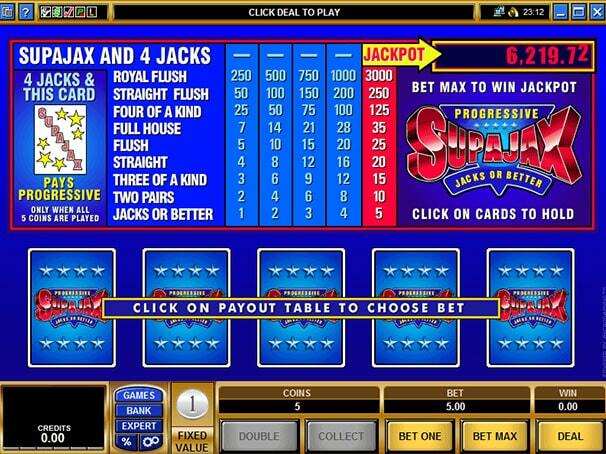 One thing you need to keep in mind is that you will have to switch your strategy as the progressive jackpot increases. As it was said earlier, as the cumulative payout becomes larger, the house edge drops and you have a bigger chance to land a Royal Flush. This would mean that your strategy also needs to shift more towards making Royal Flush rather than another hand. While you may encounter various video poker games that offer progressive jackpots, there are several we think will offer you both the needed level of excitement and will provide enough opportunities for landing the massive payout. One very intriguing game in this genre is the multiline variant of Jacks or Better powered by Playtech. It allows you to make a bet on 10 lines at the same time and on top of that, it offers a generous progressive jackpot that can boost your gaming balance significantly. This is a 9/6 variant of Jacks or Better which means that the payout for a Full House is 9 to 1, while Flush pays 6 to 1. If you are lucky enough to land Royal Flush on the initial draw, you will enjoy the progressive reward of the game. In addition to the chance to hit a generous jackpot, playing with 10 hands at once, allows you to enjoy great payouts even on lower-valued hands. The game flaunts a simple yet fun design and it incorporates various features to make your video poker experience even more fruitful. There is also the option to double up on your winning hands and choose to pursuit better hands. This is a rather interesting variation of video poker which offers players a wonderful progressive jackpot. It is powered by Microgaming and has a certain appeal that will definitely attract the fans of the game. It incorporates 53 cards, adding the “SupaJax” as a wild card. The progressive prize is given when a player lands a Four of a Kind with four Jacks and the SupaJax as the fifth card. In order to be eligible to receive the progressive jackpot, you must bet the maximum amount of coins which is 5. This will automatically decrease the house edge to a negative percentage, giving you an advantage over the casino. As you know, the higher the progressive jackpot is, the lower the house edge is. If you want to make sure that you are playing SupaJax Video Poker after the break-even point, you need to make sure that the payout for the special Four of a Kind with a SupaJax is 52,400 coins. Another great feature of the game is that you have the chance to make a Double or Nothing bet every time you land a winning hand on the initial draw. If you take the risk, you will have to beat the card of the dealer which will allow you to double your previous win. Yet another progressive video poker variation from Microgaming is Jackpot Deuces which is based on the rules of Deuces Wild. You have the deuces act as wild cards, substituting any rank or suit. This is a great opportunity to form a winning hand much easier and enjoy great payouts. In addition to that, you can grab a generous progressive jackpot if you form Royal Flush. There is, however, the condition that it has to be a Natural Royal Flush, meaning there should be no deuces and the hand’s suit must be diamonds. You will have to make a maximum bet in order to be eligible to win the progressive jackpot. Having the deuces act like wilds, however, have made some changes to the paytable and the lowest paying hand is Three of a Kind. This being said, thanks to the wild cards, even if you do not form a diamond Royal Flush, you can still receive generous payouts for other winning hands. This is why Jackpot Deuces is one of the progressive video poker games it is definitely worth playing.